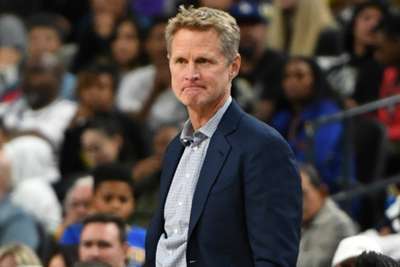 Golden State Warriors head coach Steve Kerr is braced for a slow start as the NBA champions deal with injuries and fitness issues. Two-time reigning champions the Warriors will open their bid for a three-peat and fourth title in five years when they host the Oklahoma City Thunder in Tuesday's season opener. The Warriors have been a dominant force in basketball but Kerr is not expecting Golden State to hit the ground running against the Thunder, who could be without star guard Russell Westbrook. "We're not in perfect shape," Kerr told reporters on Monday. "Shaun [Livingston] is questionable. Draymond [Green] only played one and a half games I think and needs more conditioning. So we've got some young guys we're going to count on." Kerr continued: "Camp was great, but we had a let-up last week defensively. We're trying to address those mistakes that we made and we'll see where we are [on Tuesday]. "I don't anticipate that we're going to be in high gear right away. We're not going to be nearly as good tomorrow as we will be down the road." Warriors star and reigning NBA Finals MVP Kevin Durant added: "Obviously, you want to play a good brand of ball every time you step out, but you also try to start seeing how deep your rotation is, because we’re preparing for the playoffs. "We trust coach's adjustments and anything he throws at us we try to handle as best as possible." It will be a night of celebration at Oracle Arena, where the rings-and-banner ceremony will take place pre-game to honour the defending champions in the Bay Area. "It's a huge night, an emotional night, a night to celebrate, a night for our fans to enjoy," Kerr said. "Then you've got to tip it up right after, that's the challenge. "You have to make that transition from celebrating to competing just like that. Fortunately, we've been through it a couple of times and hopefully, we'll adapt quickly and get into the flow of the game."